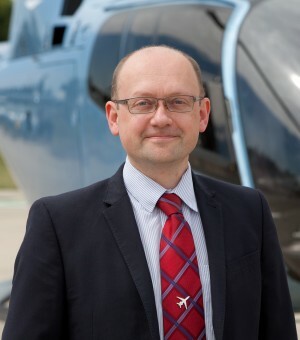 Chris is one of the founders and shareholders of SaxonAir and today plays a role within the wider SaxonAir group of companies as its Group Commercial Director. The role includes strategic business development, responsibility for all the groups sales activities as well as Rotary AOC accountability. The SaxonAir group includes a wide range of aviation activities from aeroplane and helicopter charter, ground handling and aircraft sales to aviation leasing and specialist offshore air logistics for the energy industry. Having started flying from an early age, Chris gained his pilot’s licence at the age of just 17 and has spent over 20 years in the aviation industry. He initially started up a flying school and air taxi business before going on to manage a successful helicopter charter company before finally setting up SaxonAir with the backing of a local business entrepreneur in 2007. Chris has a passion for aviation and is a strong believer in collaboration within the industry to bring the message of air charter’s value to business and not just as a perceived luxury showcase. In his spare time Chris enjoys running and playing football and has several holiday cottages close to the Norfolk Broads as well as a small holding with resident sheep.